The two image is identical, in which either whale or tunnel is visible. When whales are seen, they appear to head for us and the axes appear to converge. On the other hand, when tunnels are visible, they appear to head for bright exits and the axes appear to diverge. I think the tunnel illusion is a variant of the Leaning Tower illusion (Kingdom et al., 2007). 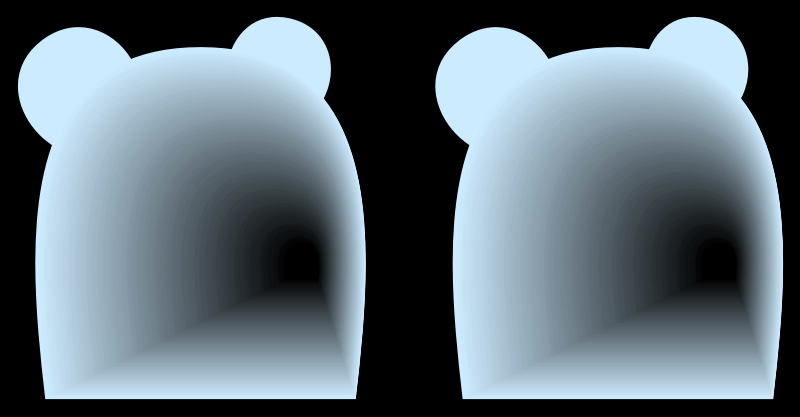 The two image is identical, in which either bear or tunnel is visible. 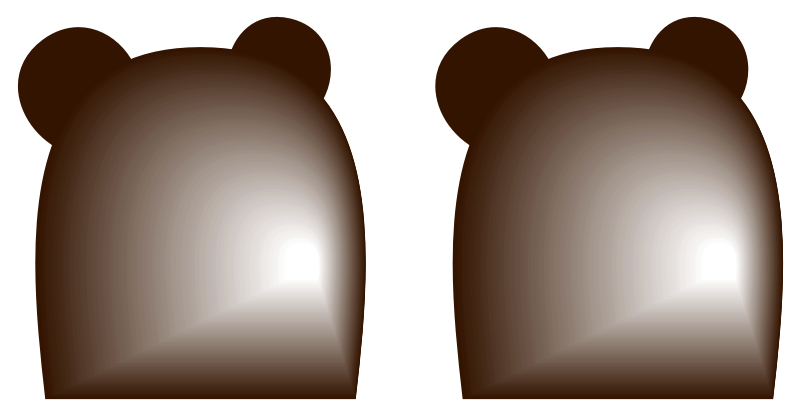 When the head of bears are seen, they appear to head for us and the axes appear to converge. On the other hand, when tunnels are visible, they appear to head for bright exits and the axes appear to diverge. The two image is identical, in which either rocket launch or tunnel is visible. When rockets are seen, they appear to head for us and the axes appear to converge. On the other hand, when tunnels are visible, they appear to head for dark exits and the axes appear to diverge. The two image is identical, in which either chocolate or tunnel is visible. When lumps of chocolate are seen, they appear to head for us and the axes appear to converge. On the other hand, when tunnels are visible, they appear to head for bright exits and the axes appear to diverge. *Mt. Fuji (Fuji-san) is the highest mountain (3776 m) in Japan. 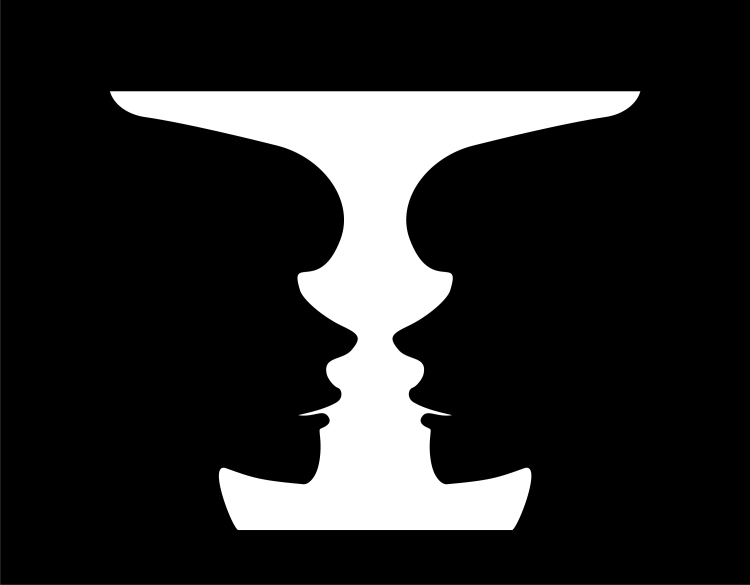 The two image is identical, in which either Mt. Fuji or tunnel is visible. When Mt. 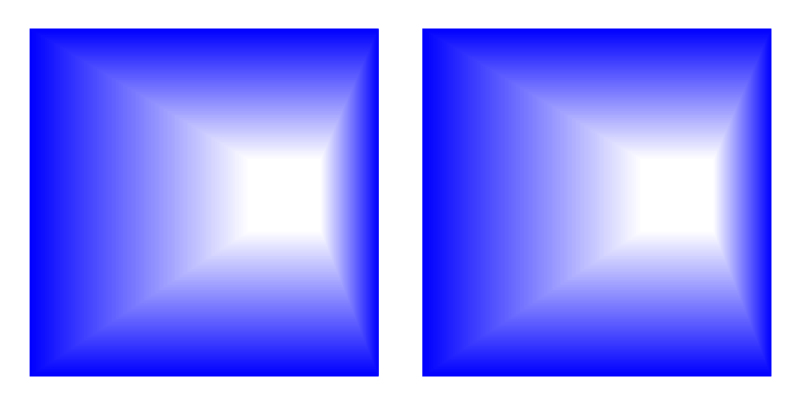 Fuji images are seen, the top appear to point for us and the axes appear to converge. On the other hand, when tunnels are visible, they appear to head for bright exits and the axes appear to diverge. 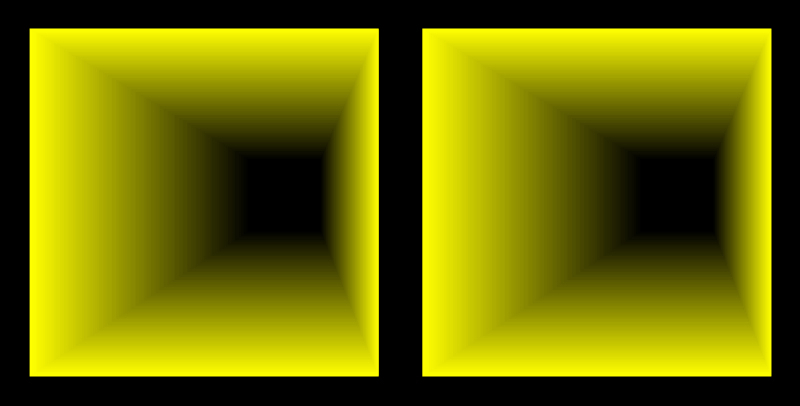 The two image is identical, in which either pyramid or tunnel is visible. When pyramids are seen, the top appear to point for us and the axes appear to converge. 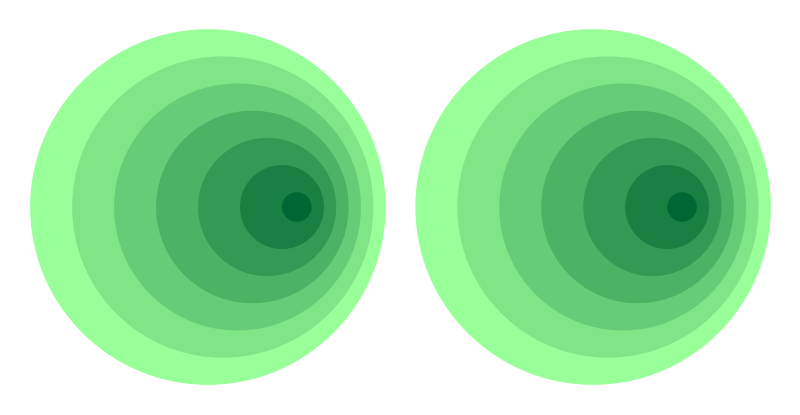 On the other hand, when tunnels are visible, they appear to head for bright exits and the axes appear to diverge. 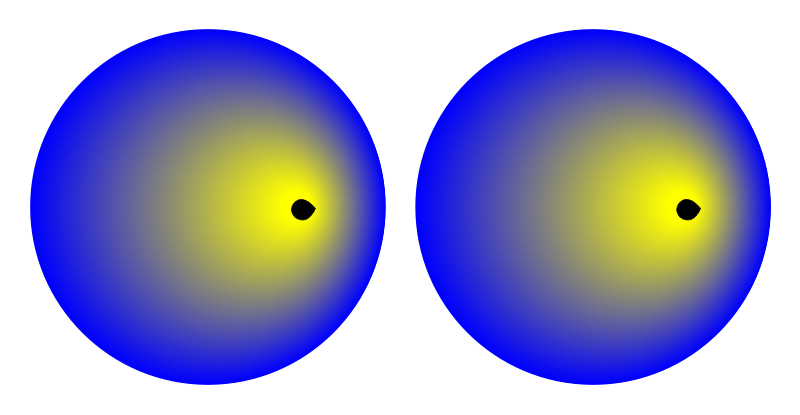 The two image is identical, in which either eye or tunnel is visible. 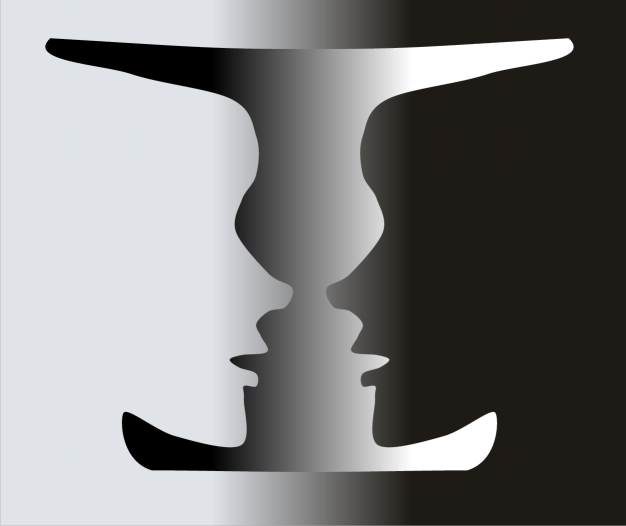 When eyes are seen, the visual lines appear to point for us and the axes appear to converge. On the other hand, when tunnels are visible, they appear to head for dark exits and the axes appear to diverge. 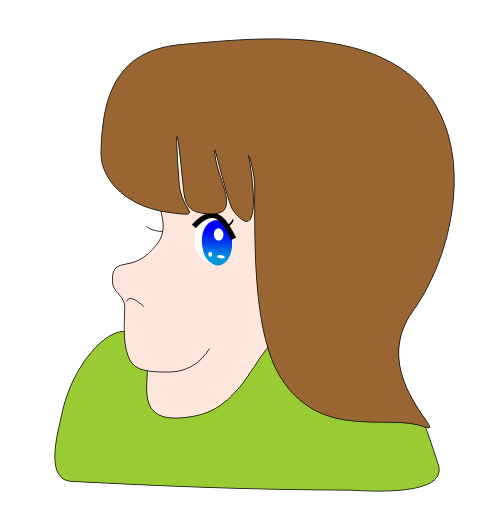 "Angry face and smiling face"
Perceived images of angry face and smiling one are reversible. "Ghost in front of or behind the cage"
When observers fuse these images stereoscopically, the ghost appears to be in front of or behind the cage. This effect is the wallpaper illusion. 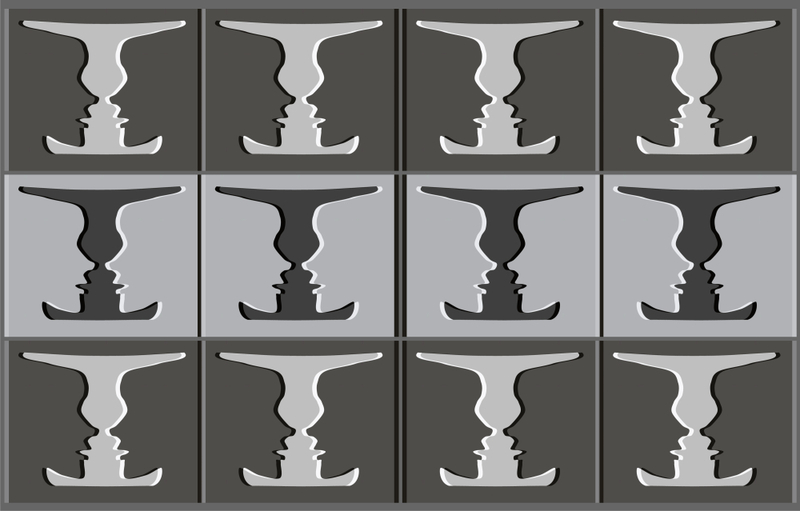 Images of Rubin's vase-face illusion appear to move laterally. 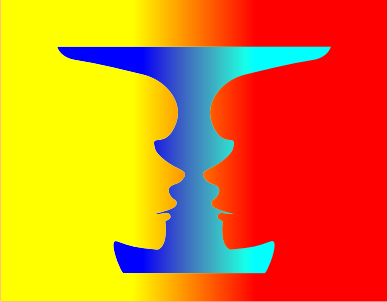 "Rubin's vase-face illusion with shade"
This image is a modification of Rubin's vase-face illusion.